This version of the Impact gallery is part of our revolutionary Web Site Publisher Pro series of plugins for Lightroom 3.2 and later. It can be used to generate an entire web site and is designed to create a very powerful showcase for your work. A single gallery or an entire site? This WSPP version of Impact will generate an entire web site based around the Impact gallery. 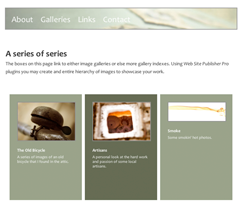 If you wish to create a single gallery suitable for inclusion in an existing site then the standard version of Impact would be a great solution. “At Svarteld, we already use the standard version of Impact for our web galleries, so when Tim asked me to make a demo site with his new plugin, I knew it would be all quality. And it is — the same gorgeous Impact look, but with a whole site building capability built right into Lightroom. And easy peasy to use, plus the flexibility of the structured hierarchical publishing services. Tim's done it again, but even better. 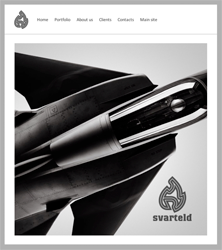 Check out the site — to demonstrate you really can build a complete web site for a photographer, I've made a smaller version of www.svarteld.com, with every image from the main site, in large resolutions for big screens. And do try out Tim's plugin yourself — it's got a very clever use of structures. Full site creation with up to 6 pages and an unlimited structured hierarchy of galleries. A contact sheet (grid) view that may be used on a per gallery basis. Incremental publishing for fast uploads. Impressive and memorable viewing experience thanks to full browser width images and sliding transitions. The first image in the gallery is displayed as quickly as possible, and the others are preloaded one by one in the background. The waiting times are therefore reduced to a minimum. Multiple image resolutions are exported and the most appropriate resolution is used when displaying the images. This ensures fast loading on mobile devices without penalising the image quality on desktop machines. Very configurable interface - the colours of all on screen elements may be changed. Users can bookmark images and return directly to them (the URL changes as the slideshow advances). Designed for iPhone. The iPhone will be served with low resolution images to increase download speed. When viewed in landscape mode the navigation bar is automatically moved out of way to leave more room for the images. Finally, users may then swipe between images. “Right-click and save” is disabled to discourage casual theft. The trial version is fully functional however only the first 3 image in each gallery will be displayed. If you decide to buy you will give you a registration code that will remove this restriction. Minor updates and bug fixes are free, major update may require an upgrade fee.